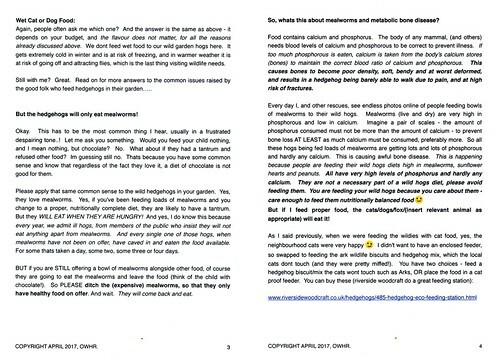 Home › Forums › Hedgehog signs and sightings › What To Feed Hedgehogs & The Danger Of Too Many Mealworms! 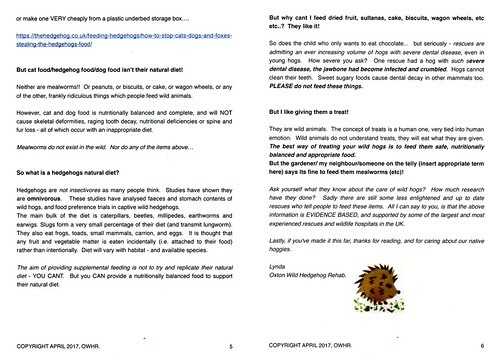 What To Feed Hedgehogs & The Danger Of Too Many Mealworms! This topic contains 9 replies, has 6 voices, and was last updated by Nic 1 year, 5 months ago. I know this subject has been covered many times before, but it seems that the message is still not getting through. Rescue centres up and down the country are seeing increasing numbers of their prickly patients with metabolic bone disease, which is linked to feeding large amounts of mealworms. Metabolic bone disease is a very distressing condition which basically robs their bones of calcium and leaves them so weak that they are barely able to stand up. 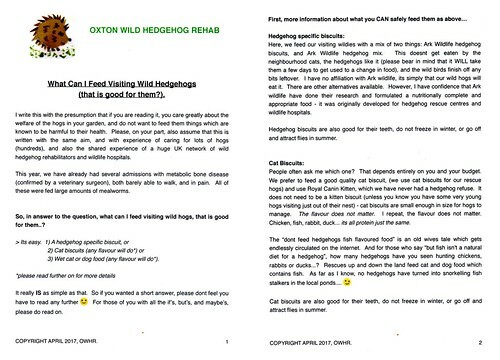 In an attempt to re-educate people into cutting back on the mealworms and feeding them a balanced diet, Lynda who runs our local rescue has written this excellent article. It is quite lengthy, but well worth reading to the end. Sorry the writing is a bit small, but it was the only way I could get it all on here. If you click on each one it will make it bigger. Very good article. Interesting that fish cat/dog food is actually ok. It is very useful to hear from someone who really knows what they are talking about. Thanks for passing this on. Thank you for attaching this article. It’s my first year of feeding hedgehogs in the garden & have been giving them a mixture of hedgehog food, & dog food but also quite a few mealworms. I will be taking your advice & keep the hogs healthy. Thanks Penny, excellent article and helpful with the cat problem too. I read some articles on bone disease and it sounded very painful and took a lot of treatment and recovery time to rehabilitate. Ours won’t touch wet food tried dog and cat in several flavours – stopped the mealworms, we’re feeding a mix of hedgehog and cat biscuits. Didn’t know why no fish food just read as others that it wasn’t suitable but to be fair ours do go a rummaging round the pond so they may be getting pond life from in there in the summer (no fish in there though). Our hogs aren’t interested in the wet pet food either (only the dam cats!). The only time they will eat it is running up towards hibernation. It’s good to know that the fish flavours or oils are not a problem; I’ve spent ages studying the ingredients in supermarkets trying to find biscuits without them in. Hedgehogs are good swimmers, so I suppose if you think about it, they would be more likely to come across a fish for supper rather than a chicken or a cow! I know that hedgehogs are partial to a few mealworms, but recent events have shown just how addicted they are. I only ever put around half a dozen on top of their cat biscuits; my theory is that if there is a chance of a mealworm the hedgehogs will still keep coming and then eat the nutritious biscuits as well. We recently made a new hedgehog hole in a gate which backs onto a footpath and in order to let the hogs know that is was there sprinkled a few mealworms around it. The first night one lucky hog discovered them and scoffed the lot. Up until that point the hogs didn’t usually start to arrive until around 10.30pm. The following evening the same hog was there looking for them at 9.00pm before I had even put any out! Since then more hogs have been arriving early and last night three hogs were spotted on camera looking for the extra mealworms. A reliable camera has been trained on the new access hole and as yet no hedgehogs have used it, they are all making their way to the far corner of the garden past four dishes of cat biscuits and back just to find the extra mealworms! Are we talking about live or freeze dried mealworms here? I though the live ones were full of goodness. Both. It is to do with the Calcium Phosphorous ratio. Please read the article above. Added to that, hedgehogs, and more so, the hoglets, can apparently get a bit addicted to them and not want to eat anything else. This would just compound the problem. A few included with a balanced diet are probably ok, but presenting large quantities of, only, mealworms to hedgehogs is not good news for them. Perhaps one of the very best things we can do for hedgehogs is to try to improve their habitat for them so they can find their own wild food. This would consist of a variety of things. I know there has been some publicity recently about mealworms or insects generally as a source of protein for humans, but I don’t think anyone is suggesting that humans should eat them to the exclusion of anything else. Before you say it, I know what we provide is only supposed to be supplementary feeding for hedgehogs, but that doesn’t mean that we can’t make it as nutritionally good for them as we can. Useful information here, thanks. Will be reigning in the mealworms from now on, and have just ordered a bag of Ark Original Hedgehog Food. Our visitor loves the mealworms which we have been lavishly putting out for him, and tends not to eat all the biscuits we leave. He is going to be one disappointed little fella from now on. If you have trouble with stopping mealworms completely in one go, try mixing a very few in with the other food and reduce them gradually. Several other people have tried this and managed to stop the mealworms completely fairly quickly. Hope you manage to persuade him to eat some more nutritious food before he hibernates. Good luck.